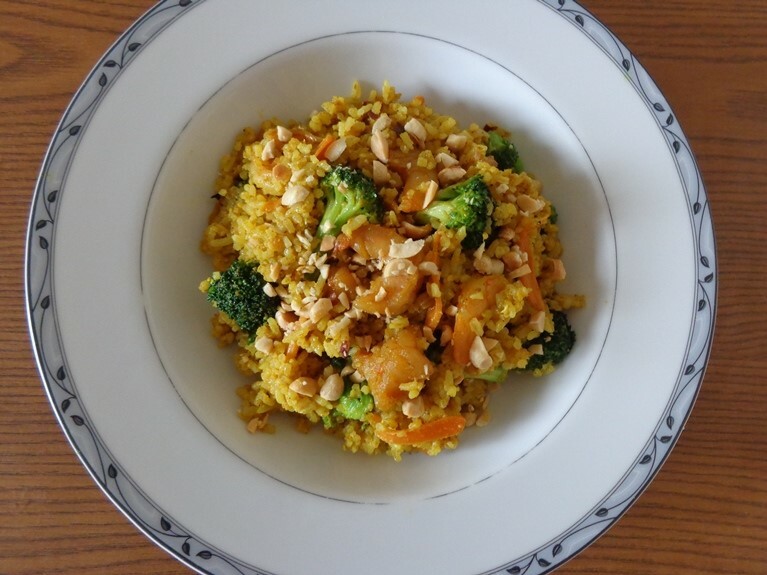 This delicious Shrimp and Egg Curry Fried Rice recipe was developed by VeeTee member Hidemi Walsh. Here is her story behind the recipe: This recipe was combined with my two favorite foods, curry and Japanese style fried rice. I mixed Thai curry and simple egg fried rice. I made Thai flavored shrimp curry fried rice then at the very last, I added eggs to my curry fried rice. Unlike regular fried rice, it has very tender texture, in between fried rice and risotto. So I added some crunchy texture, peanuts and fresh broccolis and carrots. 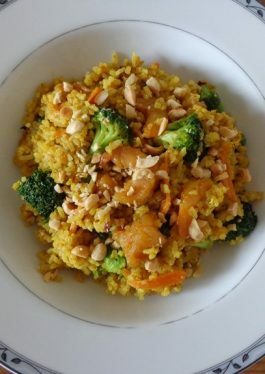 Fragrant Jasmin rice, eggs and peanuts make spicy curry milder and more flavorful. 1. Peel and mince garlic. Mince dried chili peppers and remove seeds. Cut each shrimp into half. Chop peanuts. In a bowl, mix together coconut milk, sambal, curry powder, oyster sauce and sugar. 2. In a medium non-stick skillet, heat 1 tablespoon olive oil over medium high heat. Add shrimp and cook until opaque flipping once. Remove shrimp from the skillet and set aside. 3. In a wok or deep heavy skillet, heat 1 tablespoon olive oil over medium-low heat and add chili peppers and garlic and cook stirring constantly until fragrant and garlic turns lightly brown, Add broccolis and carrots and stir fry until crisp tender. Add the rice and stir fry for 2 minutes. 4. Add shrimp and coconut milk mixture to the wok/skillet and stir fry until combined. 5. Add the eggs and stir fry until eggs are set and combined with fried rice. Lastly add salt and black pepper to taste. 6. Divide the rice among 2 servings and put into each serving plate and sprinkle with peanuts over the top. Tips: Salt and pepper to taste!